In case you fear the absolute loss of elegance and artistry in our world, take heart, there remain pockets of sophistication alive and thriving. Last week in Newport Beach, the Decorative Arts Society (DARTS) celebrated its 20th anniversary in grand style at the tony Big Canyon Country Club. More than 350 design aficionados descended upon the valet station at Big Canyon for an extraordinary luncheon experience. Twenty-two renowned designers, led by internationally recognized Tim Corrigan of Los Angeles and Paris, created luncheon settings at individual tables in the club dining rooms. It was a visual tour de force of creative design. The event was chaired by the founder and president of DARTS, Mary Anna Jeppe. Guests arrived for a late morning champagne reception and silent auction. The gathering was certainly a who's who of local society. The smartly dressed crowd mingled over auction items and sampled fine jewelry on display courtesy of major event benefactor Lugano Diamonds, represented at the luncheon by talented diamond broker Moti Ferder and his charming wife, Idit Ferder. Their salon executive Stuart Winston chatted with guests admiring a $10,000 pearl necklace donated by Lugano for the luncheon drawing. Sipping champagne in the diamond salon were DARTS devotees Sandra Ayres, Claire Belden, Hyla Bertea, Barbara Bowie, Mary O. Buckingham, Sally Crockett, Ann Dennis, Elana Donovan, Carolyn Garrett, Nadine Hall, Marion Hartwich and Ninetta Herbert. Also spotted in the chic crowd were Dee Higby, Olivia Johnson, Tracy Kirwan, Shanaz Langson, Karen Littlefair, Suki McCardle, Karen Nichol, Cecilia Nott and Marion Palley. Luncheon guests entered the main dining room, table-hopping in order to explore the drama. Participating designers included John Benecke, Barclay Butera, Suzanne Rheinstein, Tom Stansbury, Sheldon Harte, Kathryn Ireland and Hutton Wilkenson. 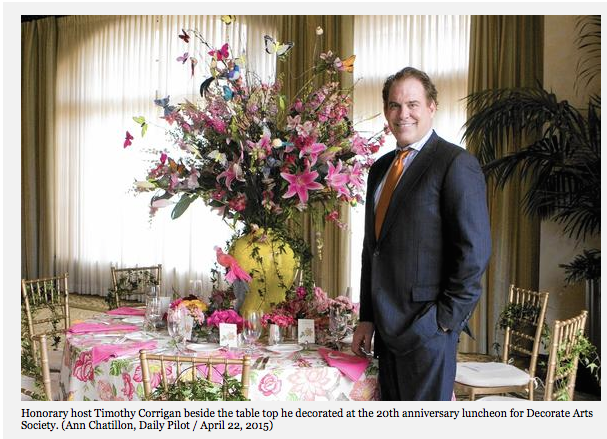 Garden designer Molly Wood created a fantasy landscape table top, while classically trained decorator Tim Corrigan placed at center table an enormous yellow ginger jar overflowing with pastel spring florals accented with colorful silk insects, butterflies and birds. His centerpiece was at least 5 feet tall. Dianne Cannon, Cyndie Chu, Peter Dunham, Ruben Flores, Eric Guenther and Maureen Madigan, to name only a handful. At a time when the appropriate description of popular interior design might simply be "less is definitely less," this was an event celebrating color, creativity and colossal imagination. Speeches were kept to a bare minimum as guests were invited to share in the artistry of the occasion, reconnect with friends and meet many of California's well known design talents whose work has been featured on the pages of respected journals including Architectural Digest. For two decades the Newport-based society has sponsored many of the world's premiere experts in the decorative arts at its annual lecture series, which is produced to inform and entertain local society but also to raise significant funds for valued nonprofit agencies. To date, the small but generous group has contributed more than $2 million to a diverse roster of charities. Some of DARTS' beneficiaries include Blind Children's Center, New Directions For Women, Serving People In Need (SPIN), Laura's House, Down Syndrome Assn., Providence Speech and Hearing and Veterans First. Enjoying an elegant luncheon of grilled salmon filet and a special ice cream dessert imported from Hawaii by DARTS committee member and designer Linda Phillips were Eve Ruffato, Nancy Sheffner, Hilary Niblo, Judy Slutzky, Gigi Spragins, Carole Steele, Susan Tancredi, Susan Strader, designer Amy Vietch, Carol Wilken, Corky Winters and the elegant Nancy Wynne.